This image is a bit darker than I would have liked, but what can I say, this is the lighting in which it looks the most realistic (I tried several sunnier variants with no luck). I'm definitely really happy with the overall look of this, though -- if you've been following my renderings for a while, you might remember that I've previously had a lot of trouble trying to get anything approaching a realistic forest scene. I feel that I've finally done it. 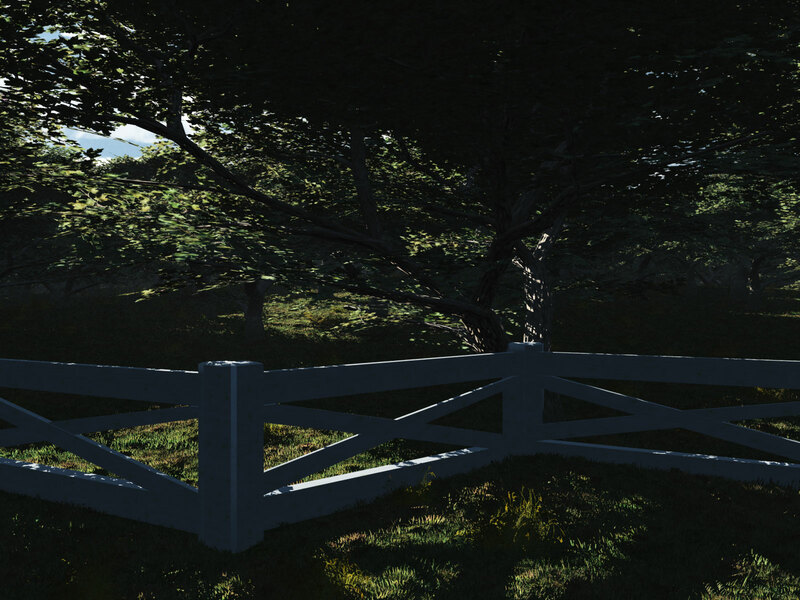 I'm also pleased with the quality of the fence, which is something that I modeled from scratch in SketchUp. I think it turned out exceedingly realistic. My wife and I went up to Virginia this past weekend, and I saw some fences like this and knew I wanted to render them. Thanks to an excellent comment by Stephen Parrish, I decided to take another stab at my Loss theme. This is the same image as Loss 3, except that I've completely redone the water (new waves, light flares, two layers of water, displacement mapping, and subsurface scattering). 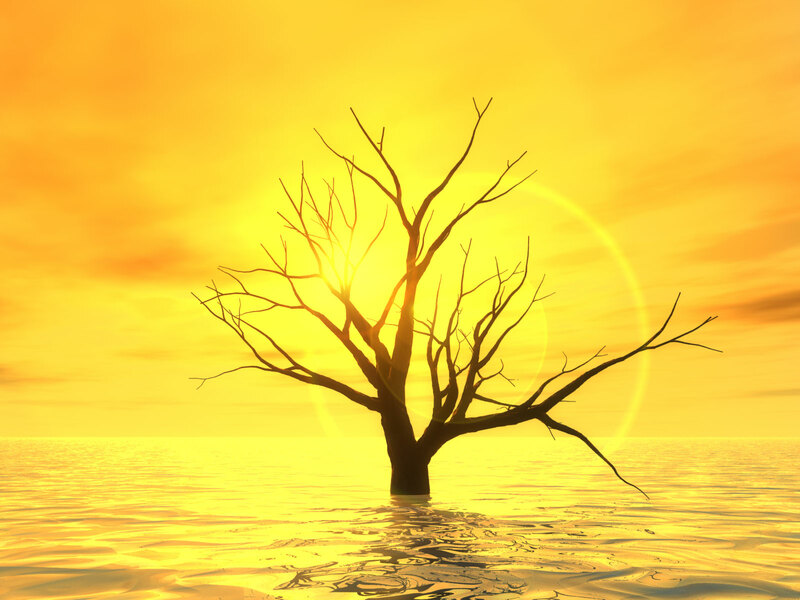 The result is a much more pleasing shadow for the tree (I think), softer waves, and a more vibrant solar reflection in the water. Another great suggestion by Stephen Parrish, who asked about orthogonal views in the rendering packages I use. While this rendering isn't strictly top-down, it's as close as I wanted to come (a little bit of side-perspective adds more depth). 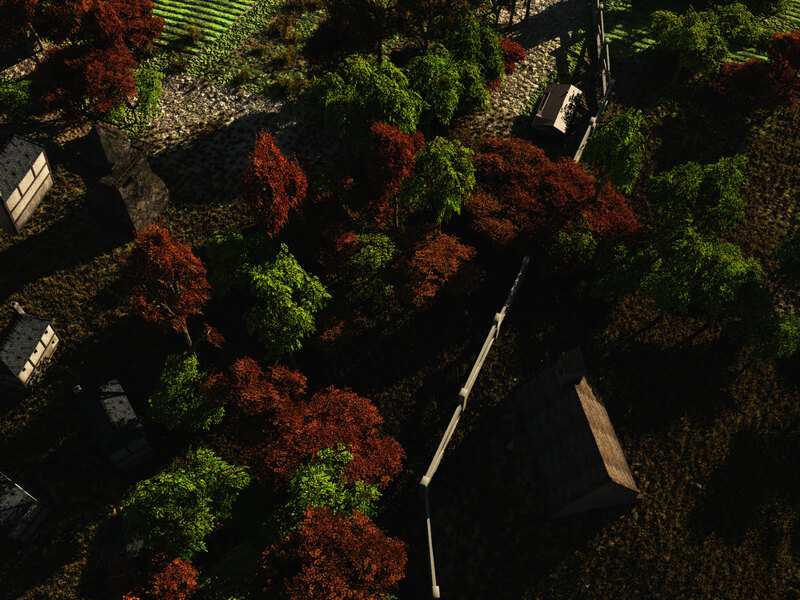 The fence is the same one I used in Forest Fence, while the houses, tower, and chapel are all free models by the fine folks at Turbo Squid. You nailed it in "Loss 4." You may now retire and write your memoirs. Don't forget: anniversary tribute to Miss Snark on Pat Wood's Blog starting May 20th.